So... let's talk about the dearth of women in engineering. Generally speaking, there really aren't a lot of us. Being one of that minority, I feel it incumbent upon me to get someone inspired, set a good example - that sort of thing. Alas, I have no daughters of my own but I have three amazingly beautiful and intelligent nieces that I am constantly trying to get involved in electronics. Perhaps I am a bit overenthusiastic, but with a little know-how and a lot of SparkFun you can make SO MANY COOL THINGS (cue evil laugh). One of my darling little relatives LOVES unicorns (for real, who doesn't?!) 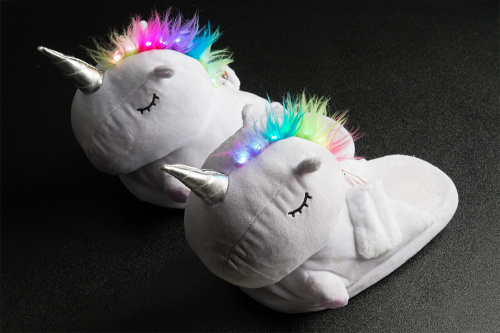 - so we decided to make light-up unicorn slippers, because LEDs. And unicorns. And warm toes. It is also a really, really simple project, which means the munchkin can help me put this together. 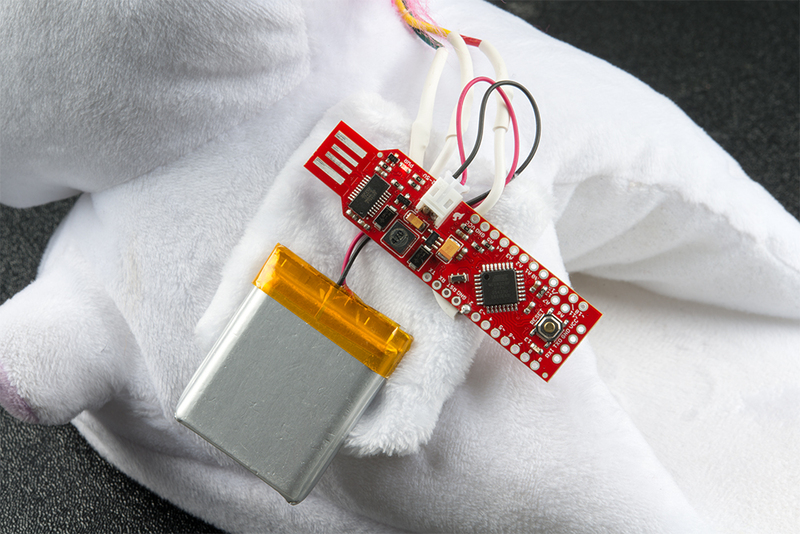 It starts with a RedStick, a skinny LED strip, a LiPo battery, and some basic soldering skills. The addressable LED strips have a wonderful hookup guide that we followed to make this happen. I soldered JST connectors onto our RedSticks, and attached silicone wire to pin 2 and the LED power supply pins. After that, the kiddo helped me out. We determined the "Rainbow Cycle" code was the prettiest (rainbows, YAY!) so we uploaded it to our RedStick. Then we attached wires and batteries to test!! All together now: OOOOOH! AAAAAH! Once we decided we liked our setup, we went to work attaching the LED strips to the unicorns' mohawks and creating "saddle bags" for them to carry the LiPo batteries and RedSticks. The back of the LED strips is peel-and-stick, so we attached them briefly that way and used fishing line to sew and secure. We cut the wires to fit the pockets with minimal overlay and then spliced the correct lines together and shrink-wrapped the connections to prevent shorts. We then plugged in the LiPo batteries and VOILA! I love watching little faces light up when they complete a project! Have you done projects with your kiddos? Let us know in the comments! On this particular project, though, I do have a minor issue: I'd be disinclined to use a LiPo battery, given that LiPos occasionally do catch fire. Combined with the propensity for kids to wear things like "favorite slippers", or even just have them close, when sleeping, this could lead to a disaster. Using something like this AAA holder from Adafruit might be a better option (I've used it with a 5V Pro-Mini with several programmable LEDs attached with good results). I had to reply to this, as your point about Lipos was the first thing I thought of when I saw kids' slippers and a Lipo in the same project. Maybe it is just a parent thing and how your brain gets rewired to protect your own kids from themselves and harm. I'd also use a simple AA holder and maybe put a software timer that shuts it off after a minute or two. Soâ¦ letâs talk about the dearth of women in engineering. IMO this is extremely positive. It means that woman are pursuing their own interests and don't feel that it's necessary to follow the path laid down by men. Men and women are different - it would be so boring if we lived in a single-gender world. Vive la difference! Bravo to your slippers. Given my personal experiences, I would hesitate to agree with your initial premise that this means women are pursuing their own interests. I have, throughout my life, been repeatedly discouraged from going into a "man's field" and have flat out been told that women can't do math or engineering. My collegiate classes had 250 guys... and me. I still see it; I still hear it. Little girls who ask me about what I do and then tell me "that's boy stuff". Or the boys on my kiddo's soccer team who couldn't believe that I was an engineer. One of them actually asked me "They LET you do that?". The persistence of our traditional social constructs is far-reaching and to be honest, it is disheartening for me. The submessage here is that you are a victim. And yet you enjoy support from powerful corporate interests, special treatment and preferential benefits. The crybully phenomena. I fail to see the connection between supportive family/mentors and special treatment from "powerful corporate interests". I don't look for special treatment or preferential benefits. The work still needs to be done, and it still needs to be up to snuff, regardless of who you are. I am merely stating what I see and hear. There are bullies everywhere - there is no point in looking for or worrying about them. You do your work in spite of them. Mr. Hymel cites Harvard and Microsoft work on social engineering. Just the tip of the iceberg. I like your slippers - a shame you have cast this nice work as a political parable. I suspect the compulsion to turn everything into a victim story actually increases gender polarization. It means that woman are pursuing their own interests and donât feel that itâs necessary to follow the path laid down by men. While this is one possible explanation for why there's a dearth of women in engineering, there are many possible explanations, and I caution not to jump to conclusions about such a wide-sweeping cultural phenomenon in the tech world. Why donât European girls like science or technology? The reasons range from peer pressure, to a lack of role models and support from parents as well as teachers, to a general misperception of what STEM careers look like in the real world. I hope that helps! This is a fascinating field of study for me, too, as I would love to see more diversity across all fields, including engineering. Why? Years of research and initiatives, trying trying trying to change human nature, and it's not sticking. People should do what they like, not cast themselves into a mold designed by social engineers. You'd like to reprogram gender preferences that are rooted in biology - millions of years of evolution (not millenia). The mission to pressure-fit everyone to be an interchangeable cog is a totalitarian pipe dream. Unattainable and undesirable. People flourish when they are free to pursue the activities that fit them best. Why? Because research has shown that diverse teams are indeed more creative. At least during the brainstorming session. As a team moves into the execution phase, a more homogeneous team has the edge (this HBR article sums it up pretty nicely). A good leader would do well to know how to balance heterogeneous and homogeneous teams, and diversity can be powerful in the right situations. not cast themselves into a mold designed by social engineers. Exactly. I'm not referring to any sort of government-mandated social program here but merely a shift in our cultural thinking and actions. As it stands, many of us (myself included) were "programmed" (albeit unintentionally) from an early age to think that engineers are only men (or at least the vast majority of engineers are men). If we continue to show only one gender (or race, age, etc.) in a role to children, then it becomes a self-fulfilling prophecy when they grow up. Perhaps in the future, history lessons for "great inventors" could include Hedy Lamarr, Ada Lovelace, and Grace Hopper. This isn't any sort of "social engineering," but merely one way to show children that they can be anything and don't have to fit into a mold.